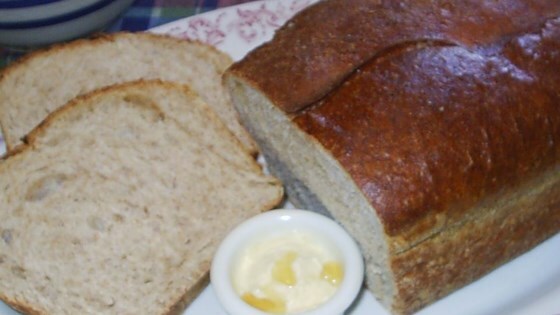 "A delightfully wholesome wheat bread sweetened with honey. This treasured recipe is tried and true." Place the warm water in large bowl. Sprinkle in yeast, stir until dissolved and let stand until creamy. Add the warm milk, honey, oil, salt, and 1 1/2 cups all-purpose flour; blend well. Stir in whole wheat flour and mix well. Add the remaining all-purpose flour, 1/2 cup at a time, until the dough is soft and workable (there may be some flour left over). Turn the dough out onto a lightly floured surface and knead until smooth and elastic, about 6 to 8 minutes. Place in a lightly oiled bowl and turn the dough to grease the top. Cover the bowl with a damp cloth and let rise in a warm place until doubled in volume, about 1 hour. Lightly grease a 9x5 inch loaf pan. Punch the dough down and turn onto a lightly floured surface. Form dough into a loaf and place into the prepared pan. Cover and let rise in a warm place until doubled in size, about 45 minutes. Preheat oven to 375 degrees F (190 degrees C). Bake in the preheated oven for 35 minutes or until top is golden brown and the bottom of the loaf sounds hollow when tapped. Remove loaf from the pan and cool on a wire rack. See how to make moist, homemade whole-wheat bread in your bread machine. You may want to add the honey to the yeast & hot water to help activate the yeast. I was very dissapointed with this bread. I kept it in the oven more than it was supposed to be in there (1 hour and 30 min) and it was still soggy inside. Would not make it again. Used olive oil for the vegetable oil, and sea salt. Baked in a dark metal loaf pan, came out perfectly at 35 minutes. Thank you for a great recipe! My dough was very hard and I could not add all the flour called for by the recipe. The dough however rose well and the flavor of the finished product was wonderful. Will make again!